This school desk and chair are joined together. There are two panels of wood on either side of the chair, and two panels of wood on either side of the desk. These are fixed to two runners that hold the chair and table together, like train lines. One reason for this design is to strengthen the chair and desk. An individual desk and chair with four legs each may have broken easily with rough treatment by children. The design also stopped the children from swinging or rocking back on their chairs and falling over. The desk was fixed, and so was the child! The desk has a hole on the top right-hand corner and an ink well fitted into this space. Monitors filled the ink well every morning, and throughout the day as necessary. Children dipped the nib of the pen in the inkwell and wrote in their exercise books. A groove runs alongside the inkwell and held pencils and pens in place. The desk has a sloping surface to make it comfortable for writing. The lid lifts to reveal a large space inside for keeping textbooks, exercise books and pencil cases and other equipment. The lid also provided cover for children - they could lift the lid to hide from the teacher, and eat sweets or chat to friends. Children hid sweets or forbidden toys such as catapults in their desks. This wooden desk is clear but old school desks often had graffiti, with children etching their names into the wood. This is a single desk, designed to seat one child. The desk could be on its own or grouped with other desks. This is a 20th century school desk, similar in design to the desks of a Victorian classroom. 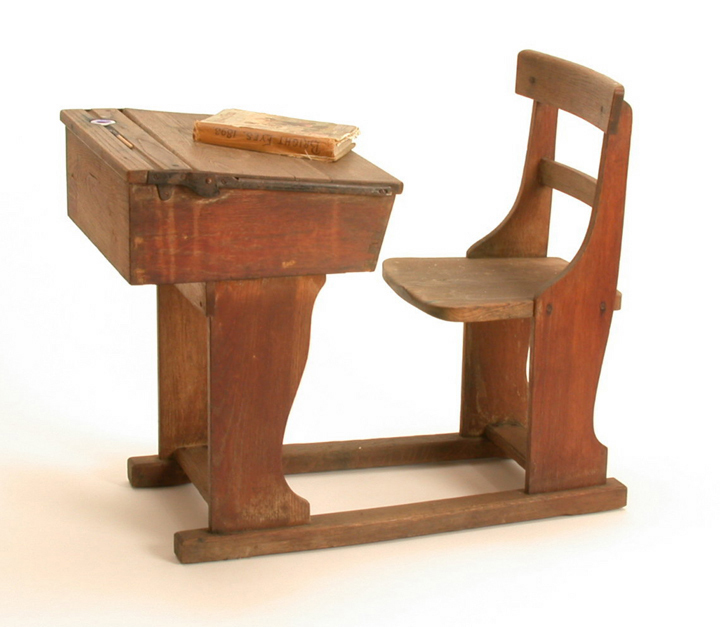 In the Victorian schoolroom scene, there are single desks with seats on the left which are similar to this desk. The desks on the right hand side are simpler, with long benches and flat surfaces to write on. These had the advantage in that many children could sit together on one bench. Victorian classes often had more than 40 children, and in small schools, two or more classes were taught in the one room. Schools had to make the best of all the available space. Desks were set out in rows in the schoolroom to impose order and discipline. Fixing the seats to the desk made the rows very neat and rigid, and the children could not move about or scrape their chairs on the floor. Seats were usually attached to the desks by iron bars and the frame was often screwed into the floor. Children sat in rows facing the teacher and the blackboard. The teacher wrote on the blackboard and the children copied the work on their slates or in their 'copy' books. Late Victorian desks tended to be iron-framed with a seat and desk made from solid oak. They were sturdy and strong with a working life of over 80 years. The desks had attached seats and came in a variety of designs. There were flat or sloping tops, some benches had back rails for support and some had foot rails to rest the feet. Some of the desks had simple shelves to keep books, while more expensive desks could hold lots of things in a desk with a lid. Desks had inkwells or slits to hold slates. Desks could be ordered in any length. Sometimes the seats would flip up to create more space and make it easier to move in and out of the desks. Flip-up seats were useful because the children had to stand up a lot in the course of a school day. They stood up whenever the teacher came into the class, as a sign of respect, and they stood up to answer questions. They also did drill at their desks - this was a series of exercises involving stretches and jumps. Desks did not change much in design in the first half of the 20th century and the fashion for having the seat attached carried on. This desk is made of lighter wood and was not fixed to the floor. The teacher's desk was a tall wooden podium at the front of the class, with a high chair so that he or she could tower threateningly above the pupils and see all the way to the back of the class. Sometimes the teacher's desk had a cupboard to store books.